As we brace ourselves for another cold snap, it’s now feeling as though winter is well and truly upon us. But with winter comes added dangers when driving – the shorter days mean we make more journeys in the dark and prolonged periods of bad weather that, at their worst, can lead to snow and ice on the roads. It’s the slippery roads created by the snow and ice that cause the most dangerous driving conditions that many of us are likely to face. Which is why up and down the country fleets of gritter lorries are already out de-icing roads and keeping them clear and safe to drive on. These fleets are run by your local government authority, the Highways Agency and their contractors as they have a legal obligation to keep your roads clear. This isn’t a simple task. Many authorities are responsible for 1000’s of miles of A & B-roads that must be gritted as soon as temperatures start to fall. Most councils now publish their gritting routes online for you appreciate the scale of task. In addition to the actual task of de-icing, they must ensure their salt stocks are at least at the level set out by the government and, working closely with the Met Office, forecast when the weather will be cold enough to send out the gritters. All of this makes de-icing our roads a multi-million pound operation, funded from your council tax. Although this might seem like the millions of pounds being spent with no return, it’s actually a huge investment in our economy. It’s been calculated that for every £1 spend on de-icing our roads, £8 is saved in the wider economy. So how does gritting make the roads safer to drive on? Firstly the term “gritting” is actually a misnomer. Almost all de-icing of our roads is done using rock salt not grit. This is because salt lowers the freezing point of water – meaning the temperature has to fall lower before moisture on the road surface will turn to ice. When used alone, salt is effective at preventing the freeze down to about -10oC but it is often combined with additives to keep it working at lower temperatures and to improve the spreading characteristics meaning less if needed. The degree to which the temperature is lowered is dependent upon the amount of salt used. Therefore, if the temperature is expected to fall significantly over night, a greater amount of salt is needed to prevent the roads from freezing. 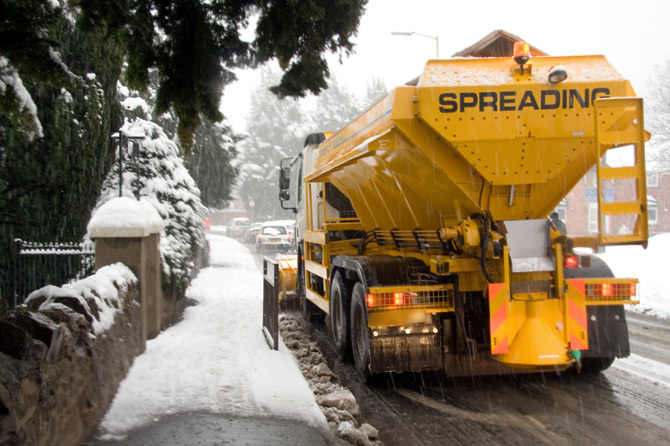 This knowledge, together with the weather forecast, enables local authorities to manage the amount of salt that they spread on each gritting run and maintain the locally held stocks over the course of the winter. The salt that’s used to de-ice our roads comes from three UK mines situated at Cleveland, Carrickfergus and Winsford. Each winter they provide between about ¾ million and 2 million tones of salt that is spread on our roads. Occasionally, during extreme winter conditions like those of the big freeze in 2009/2010, some additional imports may be required. But the salt reserves in these mines are sufficient to meet demand for several centuries and with the improvements in weather forecasting, additive technology and better management of gritter routes, salt will be helping to keep the roads clear for many years to come.